To support Pudsey Carnival, the Hall will be open from 10.30 to 1.30. Refreshments, snacks available. Tours of the hall and a display of historic Masonic regalia. The Worshipful Master and officers of the Lodge Initiated Mr Elliott Matthews as a Freemason. He was afterwards received into the Lodge in the usual manner. Members of the Lodge and their guests joined with the other lodges meeting at the Hall to celebrate Burns Night. After an excellent dinner, everyone was entertained by singer Kathie Ryan. The Worshipful Master and officers of the Lodge Passed Bro Draper to the degree of a Fellowcraft. W.Bro. 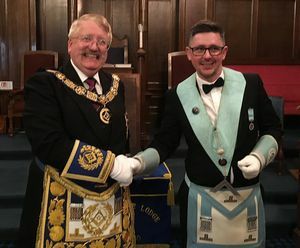 Stephen Woods was elected as joining member of the Lodge. The Master Elect. Bro. Ludo Geci, was installed as Worshipful Master by W.Bro. Prince, in the presence of the Provincial Grand Master and a large number of members ad guests. The new Worshipful Master then appointed and invested his officers for the year. Afterwards, the brethren dined together in peace and harmony.